This dream occurred when I lived in North Fitzroy. It used to occur a fair bit and rarely ever had variants. I happened just before my mac 512K was stolen and at the time of the debate about the Australia card. So I think it was sometime around 1984. Many people I knew were seriously involved in the fight against the card. Much later I was given an address to do with the computer. It was in Moreland Street. I can’t remember the number. I think I have remembered it correctly. I should still have the bit of paper somewhere. Sometimes the dream involved watching the F111s take off from near Sydney. But this was rare. Generally it started with me sitting in a trench. There was a trench running across the middle of NSW from north to south. The people manning the trench seemed to be on the western side, the thread coming from the east. 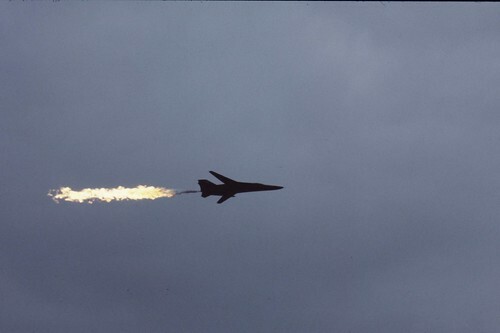 The F111s would fly over to take reconnaissance photos of the trenches. But there was never any bombing and the people on the ground had guns, but did not fire back. The aircraft would sometimes drop leaflets. For some reason Dubbo was important, though it was on the western side of the trenches. Apart from that, nothing really happened. I think that when the card project was cancelled, the dreams stopped.